Just relax, fish, & learn. Fishing is one of America's favorite pastimes. These are memories you will never forget! Catfishing has become extremely popular over the years for a reason. These fish can grow to enormous size and are very strong providing anyone who catches them a great time! Our guides have spent a great deal of time studying the patterns of these catfish to provide you with an awesome catfishing experience regardless of the time of year. Any day of the year is a great time to catch a monster catfish! We will be more than happy to explain to you what we are doing and why to help you improve your catfishing skills! 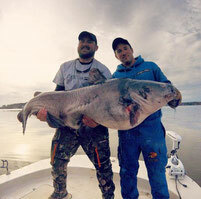 Blues Brothers Guide Service now holds two North Carolina state records for largest blue catfish. The first record was 91 pounds which was set on December 20, 2015 and then broke that record again with a 105 pound monster the following day, December 21, 2015. Both state records were caught within an 18 hour period of each other as well. We've also landed numerous other fish in excess of 80 and 90 pounds, which also rank among the top Blue Catfish catches in the history of N.C. Come try your luck and see if we can put you on a record fish! Our guide service promotes the practice of C.P.R. (Catch. Photo. Release.) We release all catfish over 15 pounds to help preserve the sport for generations to come. Of course if you are wanting to take a few smaller fish home to eat you are welcome to! 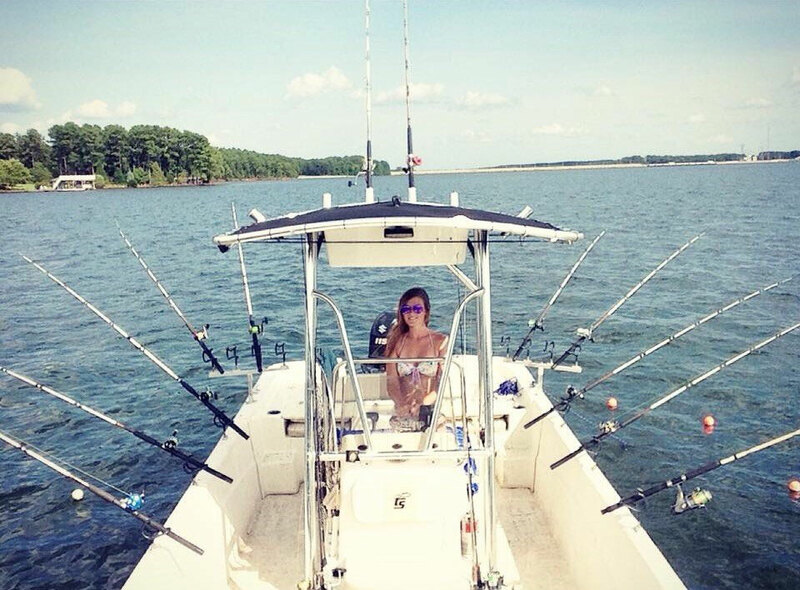 Book a trip with us today and come experience the amazing catfishing that Lake Gaston and Kerr lake have to offer and have a great time you will always remember! We look forward to spending the day with you! We are your #1 blue catfish guide service for Lake Gaston. Bait and equipment are provided. You will be enjoying your guide trip on one of our two new Carolina Skiff 218 DLVs. Come and enjoy a day with us on beautiful Lake Gaston!